Raghunandan was born into a family of physicians6 in the Shaka year 1432 (1510 AD). His father’s name was Mukunda Das, his mother’s name is unknown. Mukunda Das was Narahari Sarkar Thakur’s older brother. In the fifteenth chapter of the Madhya-lila of Chaitanya Charitamrita, it is clearly said that Mukunda Das was physician to the king. Once when Mukunda Das was engaged in treating the king, he saw a peacock feather and fainted. This incident is also described in the Chaitanya Charitamrita (2.15.121ff). His home was in Srikhanda, a village in Burdwan district. On the Katwa-Burdwan rail line, the first station west of Katwa is Sripat Srikhanda, and the second Srikhanda. Mukunda Das’s home is about one mile from the Srikhanda station. Raghunandan Thakur took birth on the Vasanta Panchami day. His uncle Narahari took a great deal of interest in raising Raghunandan, for whom he had much affection. 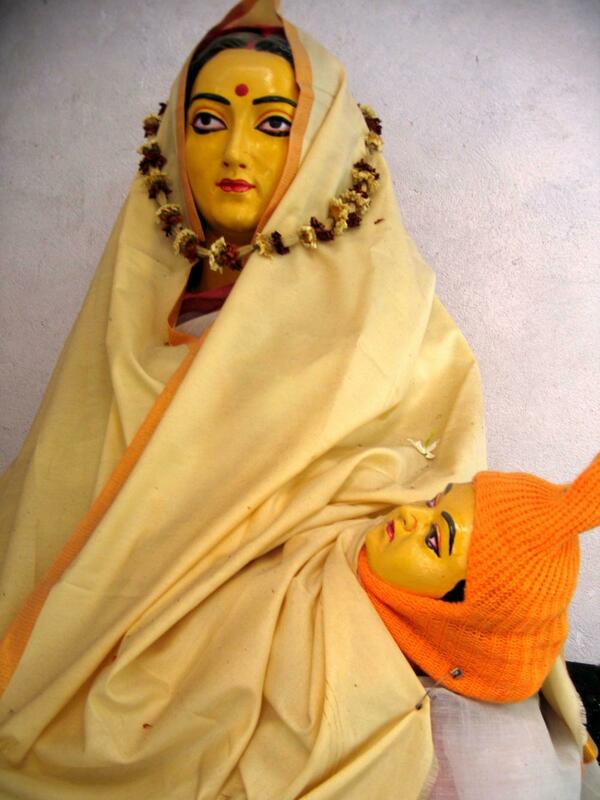 Chaitanya Mahaprabhu indicated that one’s importance increases with the depth of devotion by telling Mukunda Das that his son was really his father. MAHAPRABHU GAVE RAGHUNANDAN THE SERVICE OF DEITY WORSHIP. Mukunda Das lived in the village of Srikhanda, where his household deity was named Gopinath. One day he had to go somewhere for work and he called Raghunandan to do the service. When Mukunda Das returned, he asked the boy to bring him the prasad from the offering he had made. The child answered, “Father, he ate everything and left no remnants.” Mukunda was astonished at his child’s wonderful words that he asked him again on another occasion to make an offering. This time after he left the house, he returned and hid to watch what his son would do. Raghunandan joyfully placed a laòòu in Krishna’s hand and said in a commanding voice, “Eat! Eat!”. When Krishna had eaten half of the laddu, Raghunandan saw Mukunda Das in the doorway. To this day, fortunate people come to Srikhanda to see the half-eaten laddu in Gopinath’s hand. Raghunandan is not different from Cupid himself, says Uddhava Das with great feeling. Narahari Sarkar Thakur gave mead to Nityananda Prabhu and Mahaprabhu from a pond which was right next to the their home. This pond became known as Madhu Pushkarini. The legend is told that a kadamba tree which grew right next to the pond always had two flowers blooming regardless of the season by Raghunandan’s miraculous powers. According to the Gaudiya Vaisnava Abhidhana, another miraculous event took place in Raghunandan’s life: One day Abhirama Thakur came to Srikhanda and paid his obeisances to Raghunandan. Then he embraced him and melted with feelings of prema. Raghunandan started to dance and sing kirtan, and while doing so, one of his ankle bells slipped from his foot and went flying off, landing four miles away in Akai Hat near his disciple Krishna Das’s house. Later, in order to commemorate the event, a tank was excavated there which was given the name Nupur Kund. Raghunandan Thakur accompanied the Bengali devotees to Puri ever year at cäturmäsya. He would dance with his uncle Narahari at the Rathayatra festival in the group formed by the residents of Srikhanda. He participated in the Kheturi festival organized by Narottama Das Thakur, at Gadadhara Das’s festival in Katwa and at the commemorative festival for Narahari Sarkar Thakur in Srikhanda.